Eugene “Gene” Naasz, age 94 of Glasgow, went to be with his Savior on August 12, 2018 at the Prairie Community Hospital in Terry, Montana. Gene was born April 28, 1924 at Crow Rock, Montana; the son of Ludwig and Christina (Wahl) Naasz. He was baptized and confirmed in the Lutheran faith, was a lifetime Christian, and was active in Joy Fellowship in Glasgow for many years. Gene’s native language growing up was German, and he attended a country school at Crow Rock up through 3rd grade. He had to drop out of school, as his older sister, Erna, who interpreted for him, moved on to middle school at a different school. Gene later learned English, and his beloved wife, Gladys Rachel Hill Naasz, who he married on July 2, 1960, taught him to read. Gene loved to read, and learn new things. Gene left the family ranch in Crow Rock when he was 21 to follow his dream of being a construction worker. 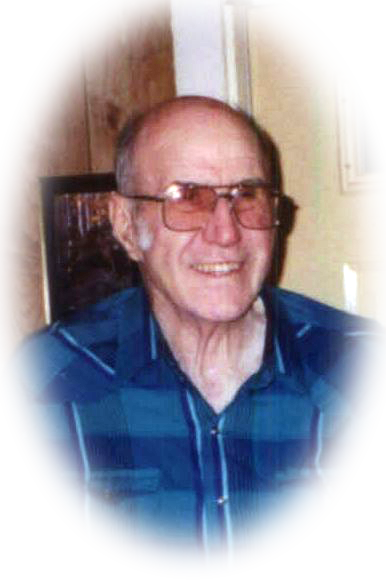 He worked on many of the wooden bridges in eastern Montana, and always had many funny stories to tell passengers whenever he traveled, and they passed over a wooden bridge. Gene also worked on Tiber Dam, Yellowtail Dam, and Libby Dam. Gene retired from Western Energy in Colstrip, and was a cat operator and an oiler. Gene and Gladys were lifetime members of the Nashua Senior Citizens, and were Nashua’s Senior Citizen’s of the Year in 1998. Gene loved to socialize, tease people, and to find the little joys all around him. He never met a stranger, and appreciated all people. He was an avid gardener, enjoyed horses, and was always one to tell a great story. Gene is survived by one son, Kenneth Eugene Naasz; one daughter, Diane Marie Naasz; one sister, Delila Scheid and numerous nieces and nephews. He was preceded in death by his wife, Gladys; one infant daughter, Dawn Christina Naasz; his parents; two sisters, Martha Neiffer and Erna Haber and two brothers Edgar and Edwin Naasz. Funeral service will be Thursday, August 16, 2018 at 2 p.m. at Bell Mortuary with Bonnie Novak officiating. Burial will be at the Nashua Cemetery with a reception at the Nashua Senior Center. I am just getting to know Diane at my work place in Colorado Springs. She recently shared that your father passed into everlasting life. I appreciated reading about his humble life of service to his family, community and friends. What a special story about a real Hero. I would love to hear his stories of the bridges and dams! My prayers are with you as both of you remember him and keep the memories of his special fatherly ways in your hearts and stories.